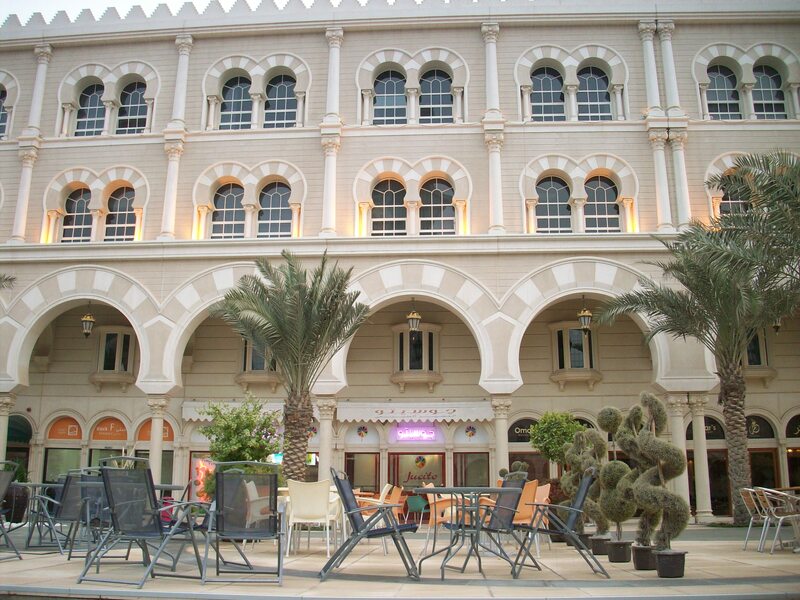 After our rather quick tour of Al Qasba (Sharjah) in June, Masood and I decided to revisit this beautiful place again, this time, making sure we enjoy everything leisurely. Yesterday, it was hot; the humidity made it more uncomfortable. Still, the place was filled with people of all ages. As promised, Masood took me for a ride in the 60-meter- high (197 feet) Eye Of the Emirates. This wheel was built in the Netherlands, and consists of 42 air-conditioned cabins. Ours was number 33, and we were informed about a “yellow” button to press in case of an emergency. 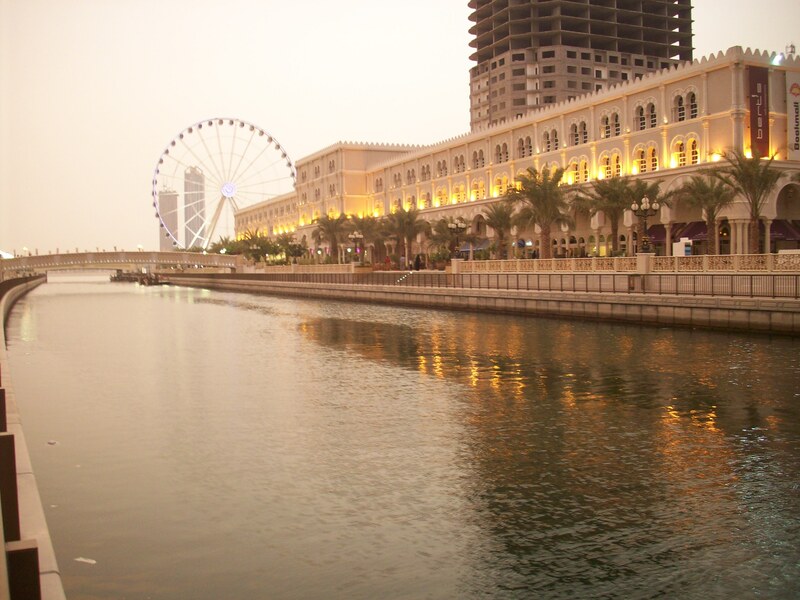 The cabins are made of glass so it gives an unobstructed and breathtaking aerial views of Sharjah and Dubai. 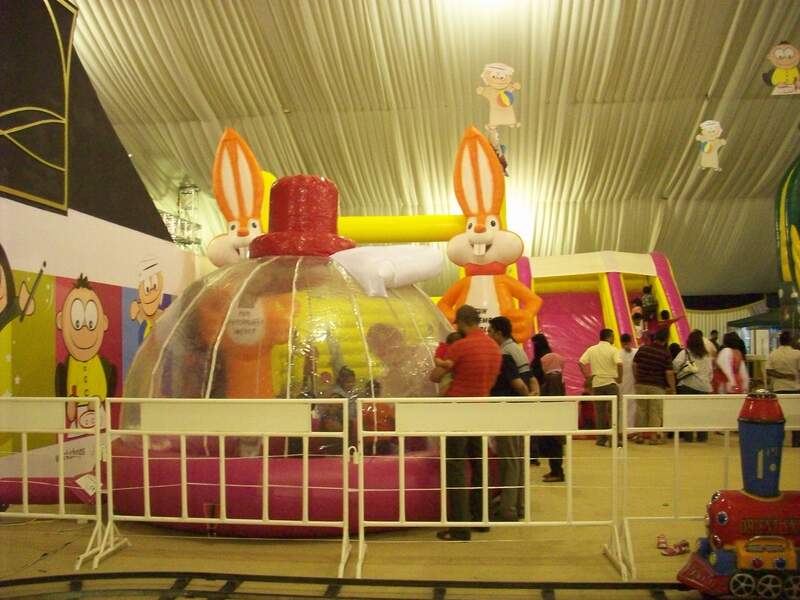 A ride costs AED 20 per person, and the wheel takes you for a complete 5 rounds. It was definitely worth the money. During the first ascent, however, we felt slightly dizzy looking down, but found ourselves comfortable after that. I tried to take photos, but it didn’t come out well. I was using the night mode, and the slight movements of the cabin made each shot blurry. We enjoyed the boat ride too. 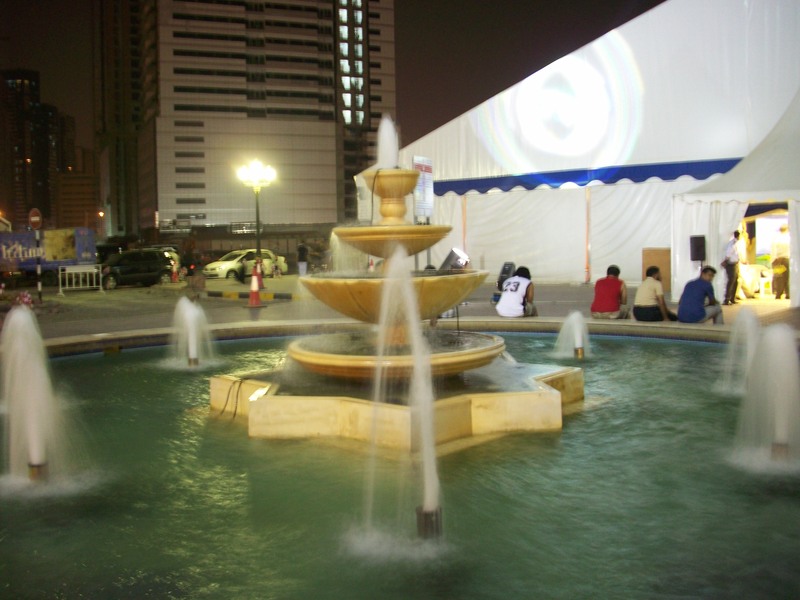 Tickets were reasonably priced at AED 10 for adults and AED 5 for children. You can also have the entire boat for yourself or your family and friends for AED 80. The boat made its way slowly along the canal, through a bridge, and into the sea along the corniche. 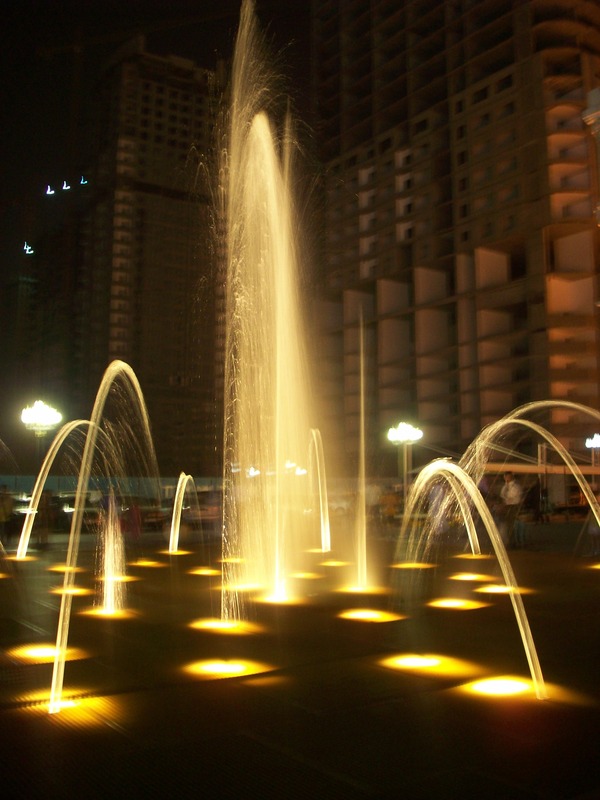 The skyline along the corniche made a spectacular view at night. The man who was operating the boat, apparently bored to death by the nature of his job – which probably starts sometime in the late afternoon up to 1 am – kept talking on his cellphone. Since the language he spoke was beyond my comprehension, it seemed to me as if he was arguing about something. That was bad, considering he was in charge of ALL of the passengers. I wondered how deep the water could be. Then, it seemed as if he was leading the boat straight up to the road ahead! Good thing the conversation ended; he probably ran out of credit on his phone. 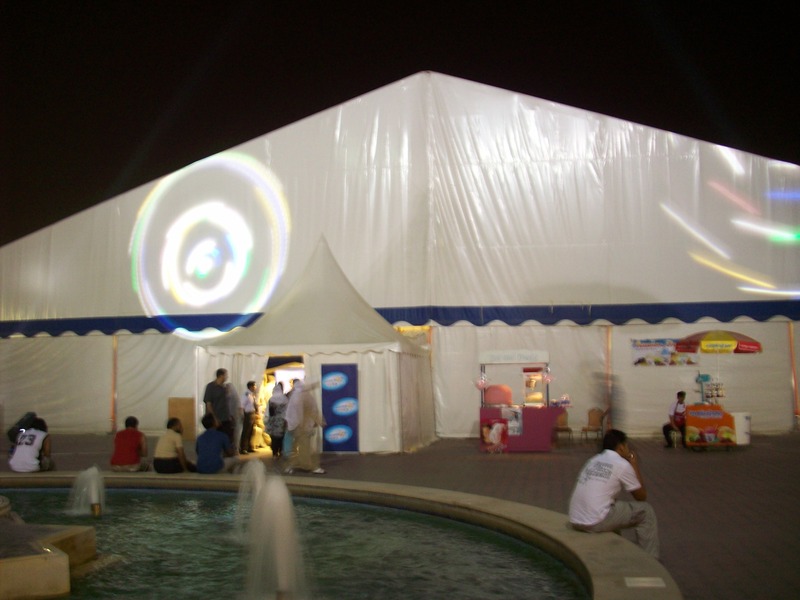 This was an air-conditioned tent for the children’s activities. It’s called the Big House of Fun. We went in to escape the humid weather outside. There were several food stalls inside. A huge plasma TV was set up in one corner, where the children enjoyed watching cartoons while comfortably settled in colorful bean bags. This was heaven for the children. 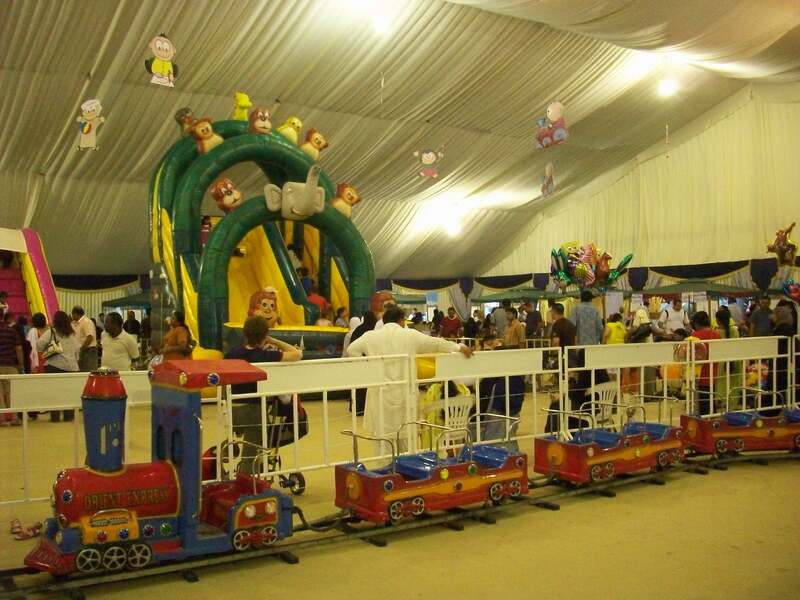 Aside from all those wonderful rides, they also have face painting and oil painting booths, which kept them busy. Ronald McDonald also made an appearance, but we missed that. 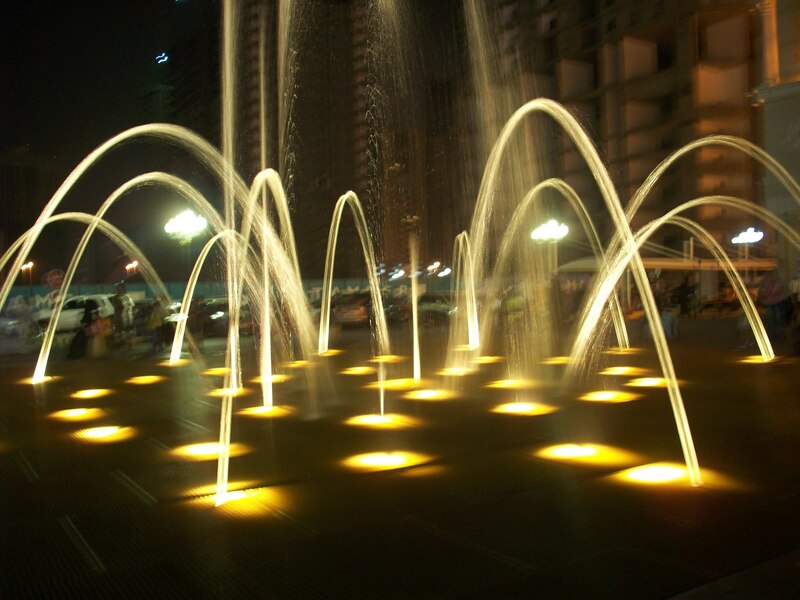 At 8 pm, the Musical Fountain displayed an amazing show for everyone. 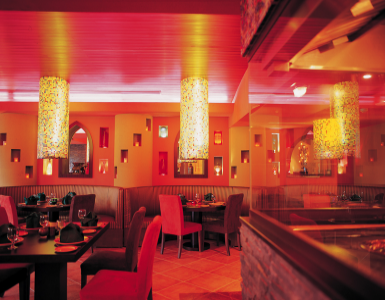 Later on, we went to enjoy a romantic candle light dinner at Masala Craft, which is an Indian restaurant. We ordered charcoal-grilled fish, marinated in the most mouth-watering blend of spices and herbs, and Hyderabadi lamb biryani, served in a clay pot, and is probably the most delicious biryani I have ever had in my life. For dessert, we ordered Firni. The service was excellent. The staff was very friendly and attentive. I would definitely love to dine again at Masala Craft, and would recommend this place to everyone. 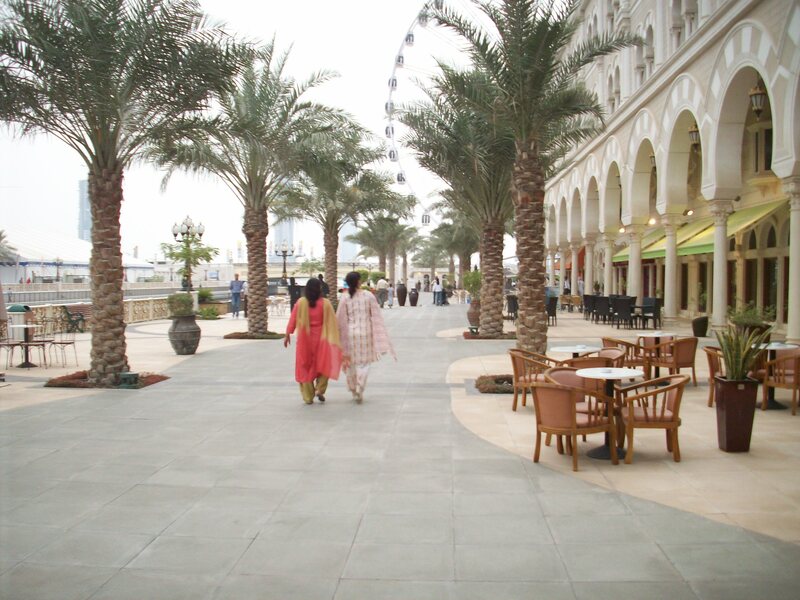 Photos from our previous trip to Al Qasba are here. 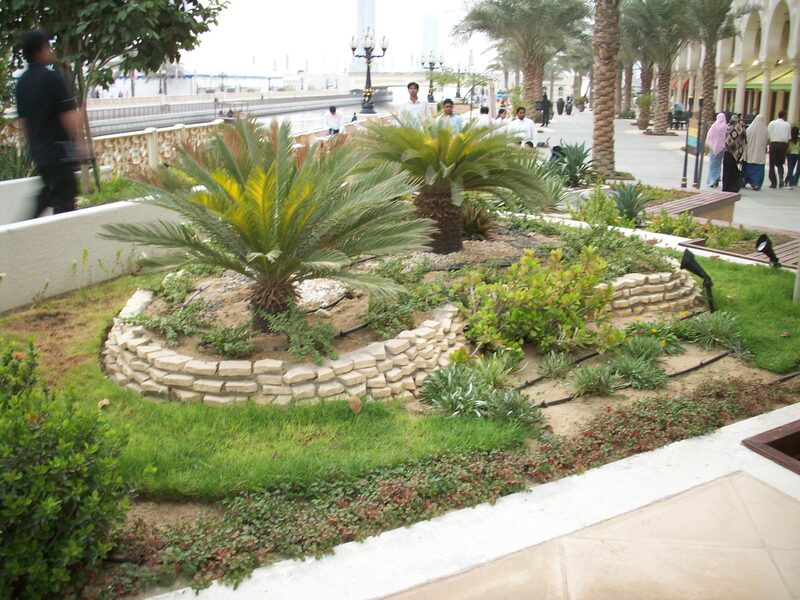 This entry was posted in Sharjah and tagged Me, Sharjah, travel, UAE. Bookmark the permalink. ~ Yes, yesterday was definitely fun, Alhumdulillah. It looks lovely. I have been to Qasba but it looks more beautiful through your pictures. It looks like it has been taken in Venice. 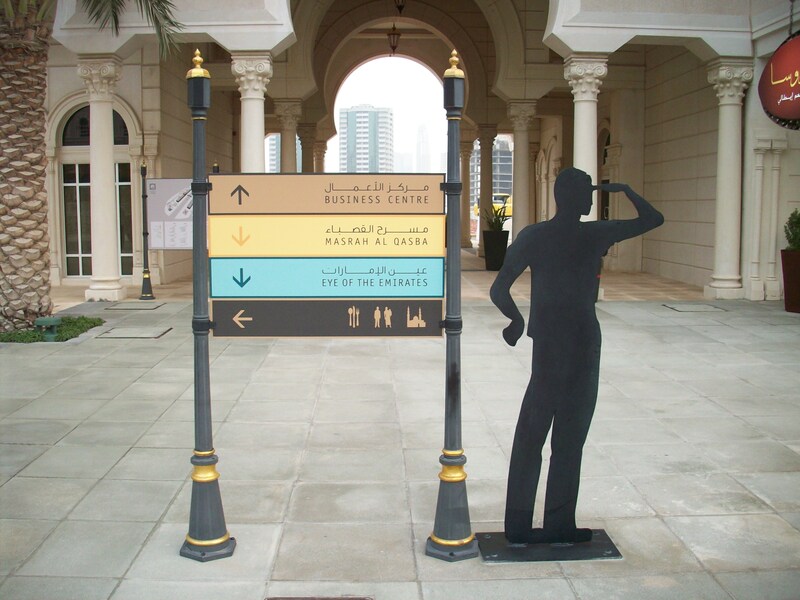 Looks good – is this also in UAE or in Oman? 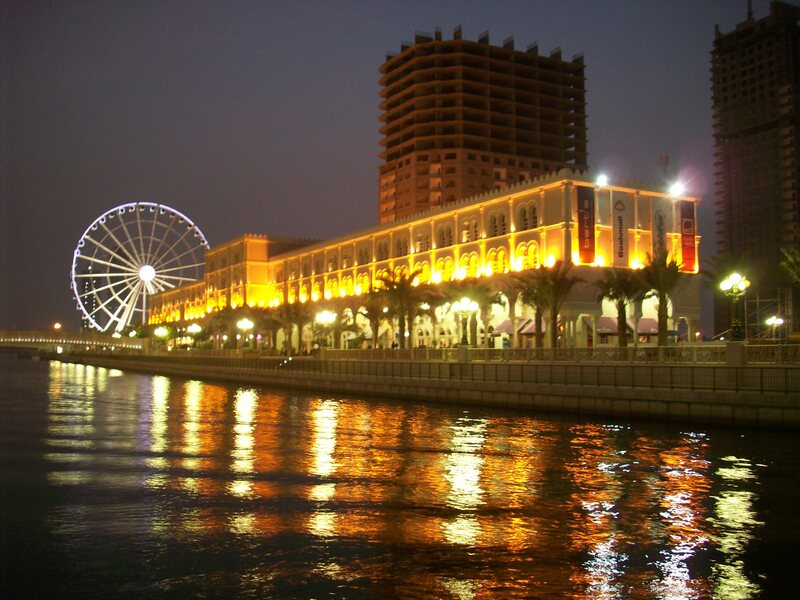 ~ This is in Sharjah, one of the seven emirates that make up the UAE. 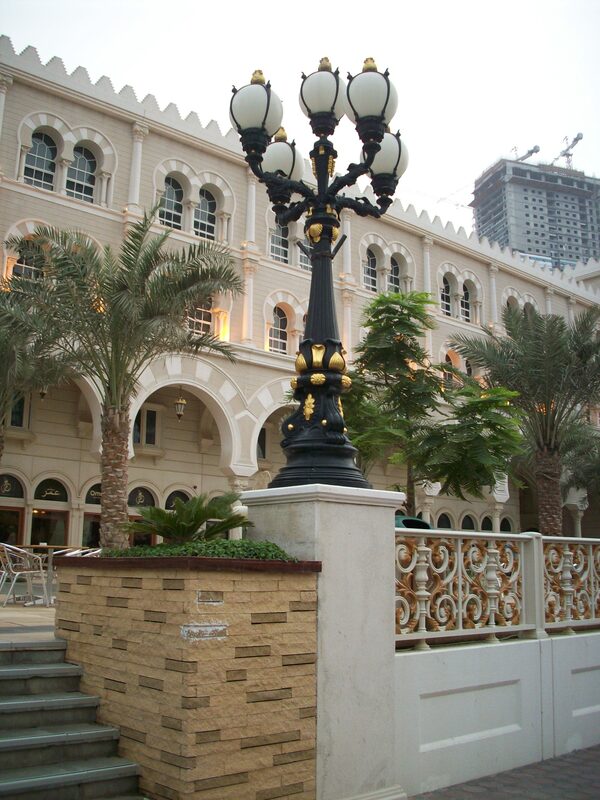 I particularly love this emirate because it has somehow managed to preserve the Arab architecture and heritage. i have visited Al Qasba before but i think i should again , tht was last year so yeah…i should make the trip again some day insha’allah! I didnt know the Eye takes 5 rounds! i was told it was only once and so thought it wasnt worth it. Anyways was that restaurant expensive? since i know most of them over there are. I should definitely try the boat ride too! ~ Yes, it does take you for 5 complete, slow rounds. 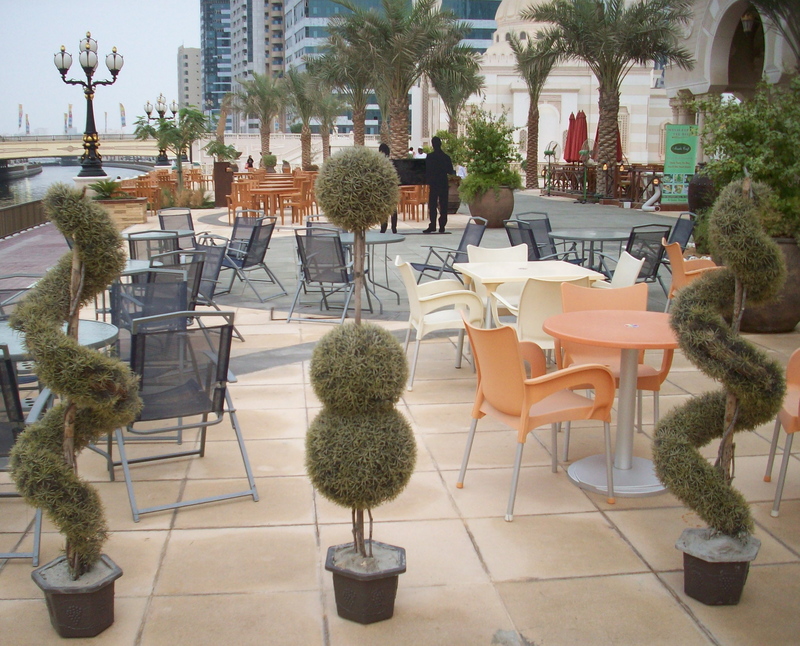 Regarding the restaurant, the fish was AED 35 and the biryani was AED 40. A meal for two would cost you somewhere between AED 110 – 120, which includes drinks, an appetizer (papad with tomato dip and slices of cucumber, radish, and carrots), 2 main courses, and dessert. The food is really great. That looks like a lot of fun 🙂 One more thing to see if/when inshallah, I can make the trip out that way! ~ You’ll love it here, InshaAllah. ~ Allowed to roam freely only in deserts..lol..that’s not really a nice way to spend a weekend. So it’s been a year already? I’m assuming that you’ll be getting your annual leave anytime soon. I hope you get to stop by Dubai, stay a few days here to try your luck, before heading back home. inshallah vl try to look in dubai. I have already took my vacation bfre 5 months itslf lookin fwd for second visit this december 🙂 hope vil try to come dubai . Your pictures really do make it look like Venice. But the place is wonderful in cooler times. Where is this Masala Craft? Within the Qasba vicinity? I would love to try out good biryaanis. Most restaurants serve biryaani that is either too greasy or too dry. Some serve pullao labelled as biryaani! To date, the best restaurant biryaani i’ve had is in Caravan, Dubai (a la carte only). ~ Masala Craft would be the first restaurant if you’re coming from the Masjid, to the left of the canal. You’re right, most restaurants do serve pulao labeled as biyaani. Masala Craft offers three kinds of biryani, and we tried the Hyderabadi Kacchi (Dum Ki) Biryani (lamb meat). It was good. Nice place and great pictures, it remind me of a special place in my life. ~ Thanks, Serene. May I ask where are you from? Im from UK. Have a nice day! Wow am sure you both enjoyed it a lot since pictures hi itni achi ayeen hei.. God bless..